Over the past 6 months, we’ve focused our energies on various projects – be it our local programs, revamping our Control Panel or Contests and Promos for our Resellers. One thing we’ve been silently working on, however, is our Hosting offering. While we have been busy building a roadmap for our future Hosting products, our primary focus has been on enhancing the scalability of our current Hosting offering so that we can continue to cater to increased demand in a stable manner. These initiatives have ensured that despite the increasingly higher amount of new sites that we host every day, our stability is always top notch. 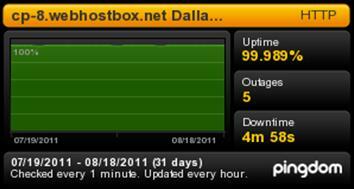 Here is a snapshot of the uptime statistics on some of our servers. These changes on the whole brought us a slew of positive reviews from some of our largest Hosting Resellers and some great feedback that we’re still incorporating, in our effort to make the best Hosting services available to all of you. September – Unlimited Domains Hosting: This has been the most widely demanded product from all our Resellers and its now almost ready to go Live. We have been in an invite only Beta for the last 2 months (If you would like a Beta Invite, please visit this page and enter your email address) and have got an overwhelming response for this new offering. January – Reseller Hosting (Bulk Hosting): By Mid-January we will be rolling out Reseller Hosting where you can give out individual cPanel accounts to your Customers & Resellers. Next Year – Within the next year we will also roll out VPS, Cloud Hosting & Dedicated servers. All of these products will be available through your Reseller Control panel and will be backed by the same industry best pricing & support that you have now come to expect from the ResellerClub group. We’ll keep giving you more information and updates about these new Hosting products. (Watch this space for more!) We would also love your feedback – do let us know what you think of our initiatives and our upcoming Hosting products, in your comments below.